As promised in the last post, here is a follow-up about Part II of the 17th World Bank Russia report, the reading of which cannot be stressed as too important in the current climate. Like in the last post, I summarize the main reports, using a lot of unattributed straight-out quoting of salient phrases and sentences of the report, interspersed with my own commentary (which I sometimes make explicit by adding NOTE). After this, I plan on writing one more post about the economic crisis in Russia to clarify and further expound on my views, hopefully in a more coherent and readable format that these first two Russia Economy Crisis posts. The World Bank first describes the genesis of the crisis, when shockwaves from the US subprime collapse rippled into the world’s financial system. Although Russia was initially a rock of stability, it was eventually undermined by the collapse of oil prices and the cheap global credit its companies had come to rely upon to finance their expansion. This triggered a collapse of its stockmarkets and an acute liquidity crisis in September. The government responded with prompt and timely monetary and fiscal measures to ensure the continued functioning of the banking system – bank recapitalization, upholding the mortgage market, various monetary loosenings, etc. The combined costs of the announced fiscal measures could get as high as about 200bn $ for 2009. As pointed out in the previous post, this is far from critical – although spending on other infrastructure projects will have to be scaled back, these temporary measures do not endanger long-term fiscal sustainability, as described in the last post. (Nor will Russia have to delve into its reserves to pay for this either, of course. It can just print money – albeit which, granted, will with time exacerbate the ruble’s weakening tendencies). We end this post with a summation of the likely impacts of the crisis on broader aspects of Russia’s economy, including on private wealth, poverty, bank consolidation and housing. The origins of the current global financial crisis can be traced to the housing market collapse in the United States. By early 2007, the subprime mortgage market was beginning to collapse, taking down with it consumer incomes and confidence. Credit markets worldwide tightened as subprime mortgage backed securities were discovered to have afflicted large segments of bank portfolios and hedge funds around the world. On 10 August 2007, central banks around the world made their first coordinated effort to ease the liquidity constraints. By the fall of 2007, major losses of the banking sector begin to emerge: UBS and Citibank, for example, wrote down billions of dollars in afflicted assets. However, the initial crises – Northern Rock in November 2007, Bear Stearns in March 2008 – were contained. The impacts of the liquidity squeeze of August 2007 were short-lived, and Russia’s stockmarket continued booming due to high oil prices and its lack of direct exposure to subprime mortgage-backed securities. 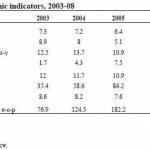 Thus, Russia was viewed as a rock of stability and attracted record levels of FDI in 2007. By mid-2008, the global financial crisis began to reach Russia on the back of a weakening and highly oil-dependent global economy. Rapidly deteriorating global conditions affected Russia in two fundamental ways. First, the tightening of global credit markets resulted in a liquidity crisis around the world, which hit emerging markets, all suffering massive losses. Second, the perceptions of a global economic slowdown led to a sharp decline in the price of oil, Russia’s main export. The stock market lost close to two-thirds of its value between May and November 2008, triggered by investor-confidence sapping events like Mechel, TNK-BP and the Ossetian War. However, this should be kept in perspective, since stockmarkets were tumbling all around the world – there were falls of 57% in China’s CSI 300, 50% in Brazil’s Bovespa and 35% in the US S&P. To analyze the financial crisis in Russia, we divide the present crisis into three phases: (1) the orderly decline phase; (2) the investor liquidity and confidence crisis phase; and (3) the ongoing and policy response phase. The first phase began on May 19, the day the Russian stock market peaked, and ended on September 12. The drying up global liquidity and investor confidence and a rapidly slowing US economy led to a ‘flight to quality’ amid fears of world-wide uncertainty. During this period, the oil price and the RTS both fell by about 35-40% in close unison. (NOTE: as I pointed out earlier, however, this decline per se is far from disastrous since unlike in the Anglo-Saxon ‘shareholder’ economies, most economic sectors in Russia are weakly tied to the RTS). With worsening global conditions, international investors began reassessing the attractiveness of the Russian market, and many investors, led by some large hedge funds, closed their positions in Russia. CDS’s on Russia’s sovereign debt rose sharply (an indicator of worsened international investor sentiment); these processes were accentuated by the fallout from Mechel, TNK-BP and Ossetia. During the first phase there were no major official announcements of policy measures specifically geared toward addressing the stock market crisis. Importantly, the decline in the stock market was contained within that part of the financial system. While some banks were facing large external repayments, no Russian bank had yet experienced repayment difficulties or an acute liquidity crisis that would warrant a strong policy response. A key policy change was that the Russian Central Bank began switching from exchange rate to inflation targeting, increasing exchange rate volatility and uncertainty about short-term exchange rate movements. The second phase marks the peak of the liquidity and confidence crisis caused mainly by the Lehman Brothers filing for bankruptcy and the bailout of AIG, the world’s largest insurer. This was a turning point that moved world markets into panic-stricken selloffs. Consult the report for the dry technical details of the effects of the liquidity crisis in Russia and the government’s immediate responses. On September 17, a massive policy response was announced. The stock market meltdown and a clear sense that global crisis had moved to a panic prompted the Russian authorities to respond with quick and massive policy measures. The previous policy of gradual monetary policy tightening was abandoned as fiscal resources were committed to shoring up the banking system and ensuring liquidity in financial markets. This was appropriate since risks had shifted from inflation to the banking system and the real economy. In addition to monetary measures like cutting CBR reserves requirements and administrative orders on banning short-selling of stocks and temporary closures of the stockmarkets, the fiscal measures undertaken included: a) a cut in crude export duty tax to help struggling oil companies from October 1, costing the government 140bn RU in revenue, b) providing a 3-month grace period for VAT payments due October to relieve liquidity pressures on private companies, costing a temporary 115bn RU, c) capitalizing AHML (agency of home mortgage loans) with 60bn RU, d) liquidity injections to the three biggest state-controlled banks (Sberbank, Gazprombank, VTB) of 60bn RU, albeit not yet implemented and e) making a temporary allocation of federal budget funds into short-term (3 month) deposits at selected banks, whose quasi-fiscal cost could be up to 1514bn RU. So in total these fiscal measures cost about 1900bn RU, which is about 70bn $ at prevailing exchange rates. Because some announced liquidity measures were not immediately implemented or did not have the desired effect, liquidity conditions had remained very tight, especially for for secondary banks and highly leveraged sectors and enterprises (construction, retail, agriculture). The segment interbank market prevented the liquidity injections from trickling down to the smaller banks, since fear of counterparty risk dominated market sentiment. The second set of policy measures announced on September 29 and October 14 was aimed at addressing the more systemic risks of the banking sector. The government recapitalized several major banks and increased the deposit insurance coverage to 700,000 RU (or about 28,000$). The CBR placed a 50bn $ deposit at the VEB bank to reduce the rollover risk of short-term external debt held by domestic financial and non-financial corporations and the government announced a plan to provide long-term financing in subordinated debt of around 950bn RU (35bn $), mostly earmarked for the three state-owned banks Sberbank, VTB and Rosselkhozbank. Other measures included a) support for financial markets of up to 350bn RU across 2008 and 2009, b) recapitalization of Deposit Insurance Agency (see above) costing 200bn RU, c) a further cut in oil export duty and other bits and bobs. Also, the CBR will be allowed to partially compensate the losses of a bank lender, if a financial organization, the recipient of the loan, fails to repay the loan (temporary measure until yearend 2009) and will be allowed to lend (short-term) without collateral. In total these later fiscal measures could end up costing more than 3000bn RU (110bn $+) . As a result of these monetary, fiscal, and quasi-fiscal measures, the authorities in Russia will affect both short-term and long-term interest rates. The impact of the second set of policy measures on equity markets was limited, however, against the backdrop of a further decline in the oil price and a panic in world markets. On November 7, the government announced a new plan for a broad set of policies to address the impact of crisis on real economy. The impact of global financial crisis on Russia will continue to be felt on several fronts in the remainder of 2008 and 2009. The final outcome will depend on the rather uncertain global economic outlook, including the price of oil and the continuing soundness of the policy responses. But some immediate effects can be estimated with some certainty. Growth slowdown: Notes how the economy is expected to substantially slow down from Q4 2008 due to illiquidity and uncertainty. Covered in more detail in the previous post, but to reiterate – the World Bank believes Russian growth is projected to be 6% in 2008 and 3% in 2009 – albeit as I pointed out, there is a lot of evidence that economic output is already in free-fall, along with the rest of the industrialized world including China. Which is really bad, of course, because it was supposed to decouple at least somewhat. I think it’s now best to hope that the fiscal measures undertaken by Russia start bearing fruit sooner rather than later. Social impact: the growth slowdown will affect real incomes of the middle class and of the poor and calls for a social policy response. The WB report has a one page box devoted to this issue, which argues that poverty reduction is going to slow down in the 2007-2009 period and that it calls optimize social assistance spending. Inflation: Some of the economic slowdown represents a welcome cooling of an overheated economy and will also help reduce inflation from the current high levels. However, the relaxation of monetary policy and ruble depreciation, inflation pressures will persist in 2009. Fiscal Costs: Although the direct fiscal costs of the announced measures are manageable, quasifiscal costs are much larger. Estimated direct fiscal costs are only 190bn RU, but the quasi-fiscal and contingent costs could reach up to about 4,639bn RU (185bn $, or about 14.7% of Russia’s GDP in 2007). (NOTE: close to my own conclusions above). These additional commitments have significantly reduced the fiscal space and halted many important initiatives, especially large capital expenditures to address infrastructure bottlenecks that might be scaled down or postponed. In the worst case, if the price of oil continues to decline toward the long-term average of about 30$ – something not envisaged by most analysts at this time – significant revisions in medium-term expenditure plans will be required. Bank Consolidation: The loan-deposit ratio of the Russian banking system increased from around 105 percent in 2005 to more than 125 percent in the first months of 2008, reflecting greater reliance of banks on foreign borrowing as a source of funding. Although the aggregate ratio is high, it is not as high as in many CIS countries in a much more vulnerable position. But large external borrowings in Russia have put pressure on some small and medium banks, which in the absence of borrowing and refinancing options, have no other significant and stable sources of funding (such as deposits). Larger banks, including private ones, are generally in a stronger position to weather the financial turmoil. Over-reliance on massive external borrowings for funding purposes will decline as a business model. Housing: Will continue unwinding, extending beyond construction to the banking sector, a provider of mortgage lending and other lending instruments collateralized with property. with a healthier and more dynamic economy.